On May 1, 1916, Orville Merillat was born on a farm in Tedrow, Ohio, the seventh of 15 children. 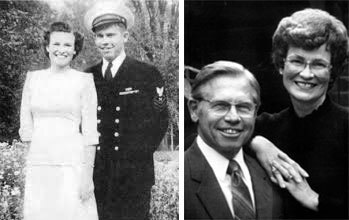 Orville and Ruth, members of Trentons Hills UB church in Adrian, Mich., sold the company in 1985 and started the Merillat Foundation. With their personal involvement in the company decreasing, they focused on giving money away. Their philanthropic generosity included Focus on the Family, World Vision, Youth for Christ, and many other colleges and ministries. Within the United Brethren church, there were many beneficiaries — local churches, camps, missions work, church planting, and the national office and its ministries. But no entity benefited more than Huntington College. Their first gift to Huntington College, in 1968, was cabinets for a house the college owned. In 1972 they led the campaign for a new athletic complex. During the 1980s and 1990s, nearly every new building and campus improvement received funding from the Merillat Foundation. Several major buildings bear their name — the Merillat Centre for the Arts, the Merillat Physical Education Complex, and the RichLyn library (named after their two children, Richard and Lynette). Orville’s office at the Christian Family Centre in Adrian was adorned with items bearing the Huntington College name and logo. He and Ruth wanted Huntington College to prosper — not only because it was their denomination’s college, but because they believed in its mission. Having completed just six months of high school, yet becoming a multi-millionaire, Orville could easily have said, “Who needs college? You can succeed without a college degree. I did.” But you heard nothing of the sort from him. Rather, he said, “I have seen the value of higher education in people who have worked for us.” Some of them were Huntington College products. You will find that people are unreasonable, illogical, and self-centered. But let God love them through you anyway. If you do good, people will accuse you of ulterior motives. Do your best anyway. The good you do today will be forgotten tomorrow. Do good anyway. It’ll let you sleep at night. The leaders of the biggest dreams can be shot down by those with the smallest minds. Think big anyway. Give the world the best you’ve got, and you may get kicked in the teeth. Give the world the best you’ve got, anyway. In short, dare to be different from a lot of people you’ll run into. If you do something worthy of remembrance, it’ll be remembered. Orville Merillat passed away January 15, 1999. 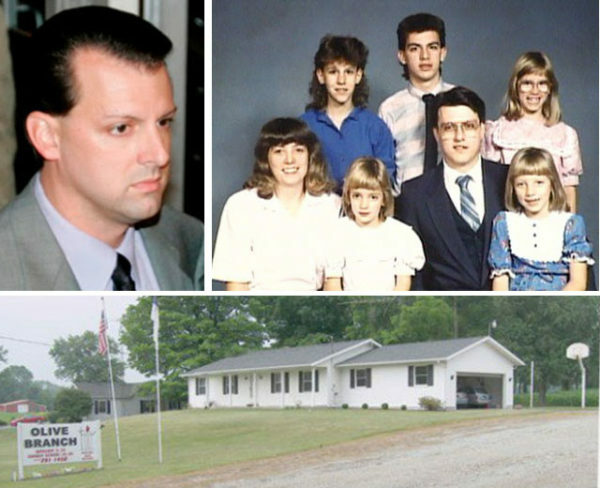 From upper left: Jeff Pelley in 2006; the Pelley family (the four victims are in front); the Olive Branch parsonage. On April 30, 1989, Pastor Robert Pelley didn’t show up for church at Olive Branch UB in Lakeville, Ind. (just south of South Bend). Eventually, two men went next door to the parsonage. They knocked several times, but got no response. The blinds were tightly drawn. Jeff Pelley, a 17-year-old high school senior, was always the leading suspect, but wasn’t arrested or charged. There just wasn’t sufficient evidence. He moved to Florida, developed a good career, married, had a child, and was teaching Sunday school. Thirteen years passed. Then a Cold Case squad reopened the investigation. Jeff Pelley was arrested in August 2002 and charged with the four murders. In July 2006, he went on trial. The evidence was very circumstantial. No murder weapon was ever found (Bob’s 20 gauge Mossberg was never located). No fingerprints linked Pelley to the crime itself. Rather, the prosecution relied on a carefully constructed timeline which put Jeff Pelley at the parsonage during a particular 20-minute period, during which he did a whole bunch of things (commit the murders, change clothes, load the washing machine, take a shower, locate and pick up the shell casings, draw the blinds, lock the doors, get rid of the gun and casings, and more). Investigators said he was angry at his father for grounding him from attending pre- and post-prom activities, and from driving his car. After the killings, they said, he cleaned up, went to the prom with his girlfriend, stayed overnight with friends, and the next day went with friends to the Great America theme park in Chicago, where he was located on Sunday. During the trial, Jeff Pelley’s attorneys insisted there wasn’t enough time for him to kill his family, do everything they claimed he did, and still make it to the prom, and that after committing an act like that, nobody would act normal, which is how friends testified that he acted during the prom events. After a six-day trial which included nearly 40 witnesses, jurors deliberated for 34 hours and returned a guilty verdict. Pelley, now 34 years old, was sentenced to 160 years in prison (four consecutive 40-year sentences). A Court of Appeals reversed the conviction in 2008, but in 2009 the Indiana Supreme Court upheld the conviction. He is now incarcerated at the Wabash Correctional Facility near Terra Haute, Ind. A book about the case, The Prom Night Murders, was published in 2009. A lengthy article appears here. The Hadleys served in Sierra Leone 1866-1869. They were the first to leave a child at home—14-month-old Mary Elizabeth, left in the care of her grandmother in Indiana. They were the first to lose a child in Africa. And Mrs. Hadley was the first to lose a spouse as a result of serving Christ in Sierra Leone. Oliver and Mahala, the daughter of a UB minister, were married in 1864. Two years later, they sailed for Sierra Leone, arriving on December 13, 1866, after a 51-day voyage. Another child, a son, was born January 17, 1869, after what Oliver described as a remarkably easy childbirth. At that point, they were preparing to leave Africa. Their ship departed Freetown on March 1, bound for Boston. The captain’s cabin was the only heated room on the ship. Seeing the Hadleys’ physical plight, the captain gave them his cabin for the journey. 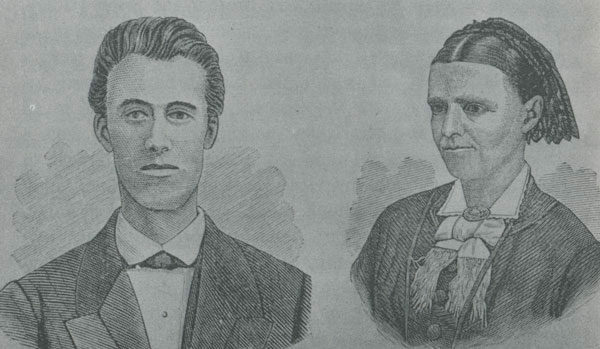 The Hadleys reached America on April 15 and continued on to their home near Lafayette, Ind. On April 28, Oliver died. He was 31 years old. Ten days later, their infant son died. Oliver Hadley was our Jim Elliott, the missionary slain by Auca Indians in Peru in 1956. There are many similarities. Both were young, had an infant daughter, and carried a passion for unreached tribal people. Both died while just getting started, never seeing the fruit of his efforts. Both had a wife—Mahala Hadley and Elizabeth Elliott—who returned to the field for a few years and experienced the joy of seeing her late husband’s hopes and prayers fulfilled. And both left behind an incredible journal. For William Otterbein, one of the United Brethren founders, six years of marriage came to an end on April 27, 1768. He was a widower at age 42, and remained single the rest of his life. Susan LeRoy was a Huguenot, descended from French Calvinists who came to America after France outlawed Protestantism in 1685. Susan’s family arrived in Pennsylvania in 1754 and settled around Tulpehocken; the next year, an uncle was tomahawked and burned in an Indian raid. But they built homes, farmed the land, and did well. Susan joined William in Frederick, and in 1765 they took a church in York, Pa., where he spent a full nine years. It was during the second year that he traveled 25 miles east to Lancaster to attend a Great Meeting, where he met Martin Boehm and an embrace launched the United Brethren movement. We can imagine Otterbein returning to York and excitedly telling Susan all about what had happened at Long’s Barn. Or, perhaps Susan was there to hear her husband proclaim, “We are brethren!” Maybe they used the trip to celebrate their fifth wedding anniversary. We don’t know. What we do know is that Susan soon became afflicted with a lengthy illness. Less than a year later, she was gone. The year of Otterbein’s marriage, a curious letter was sent to Dutch Reformed officials in Holland saying, “Brother Otterbein has entered the state of matrimony in deference to public opinion, which in America requires a minister should be a married man.” But history writers recount the great sorrow which Otterbein suffered upon the death of Susan. A Ministry Couples Marriage Retreat will be held August 7-9, 2017, at Rhodes Grove Camp and Conference Center (Chambersburg, Pa.). The event is free to ministry couples. Full funding is being provided by the United Brethren National Office the United Brethren Association for Church Development, and Rhodes Grove Camp. This three-day, two-night retreat enables you to separate yourselves from the needs of “everyday life” and invest in your marriage. The keynote speaker is Dr. Robb Palmer, Professor of Marriage and Family Therapy and Pastoral Counseling at the Graduate School of Marriage and Family Studies, Evangelical Seminary (Myerstown, Pa.). He is an ordained minister in the Evangelical Free Church of America, and has served with the EFCA in senior pastor and other roles for over 30 years. The retreat starts with dinner at 5 pm on Monday, August 7. The opening session begins at 6:30. Registration deadline is July 28, 2017. To register, download this brochure. In 1889, the year of the division in our denomination, we elected four bishops. Three of them–Milton Wright, Halleck Floyd, and Horace Barnaby–served together for the next 16 years. All three left office in 1905. And all three died in 1917. Horace Barnaby was born April 26, 1823, in New York. There is nothing particularly noteworthy about his service to the United Brethren church, but he was a solid guy who served faithfully and was respected by other ministers. Barnaby lived an interesting life, and suffered a lot of hardships. Nothing was handed to him. A year after Barnaby was born, his father went on a business trip and was never heard from again. His mother remarried several years later, after which he lived with an aunt for a while, and then, from age ten, with his grandparents. Once a year, he would walk 18 miles to visit his mother. Barnaby grew up knowing hard work. He was teaching school at age 17, and two years later, he bought from his uncle some frontier land near Hillsdale, Mich. He walked from New York to Michigan, hunted for food, and cleared the land for a home (during his lifetime, he would clear land for three different farms). He continued teaching school, and married one of his students, Lydia. In 1850, at age 27, Barnaby joined the California Gold Rush. He sold the farm, found a place for his family to stay, and headed west with a friend. It took them four months to reach California; they braved Indians and scorching heat. But they did well. A year later, they returned to Michigan with $4000 saved up. But while sleeping aboard a steamship, all of their belongings were stolen. It was a wasted trip. Back to farming. Barnaby was converted in 1852, and became a circuit-riding preacher in the Methodist Protestant church. In 1858, he switched to the United Brethren church, and was ordained in 1863. Lydia died in 1855, soon after an infant son died. He married Jane in 1856, but she died six years later. He then married Jane’s sister, Susan…who died a year later in childbirth, followed soon thereafter by the infant. With the Civil War at its height, Barnaby found homes for his two daughters, now ages 15 and 18, and tried to enlist. He was rejected three times, and never understood why, except maybe that he had a frail appearance. He went back to pastoring in Michigan Conference. In 1864, he married Sophia. This one lasted. They celebrated their 50th anniversary in 1914. 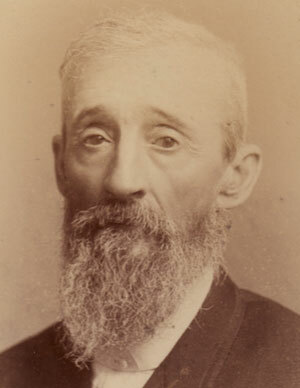 Barnaby was one of the men who guided and rebuilt the United Brethren Church after the split. We don’t know much about his contributions, but since he was a bishop, we can assume he played a vital role and made a lot of decisions. He and Bishop Halleck Floyd left office in 1905 following an unfortunate controversy over the publishing house; they crossed swords with Milton Wright and lost. Horace Jr. wrote that during the winter when his father was 83, he would go into the woods each morning with his axe, because “he felt better satisfied each day to be of some use in the world.” That winter he chopped thirty cords of wood, and when spring came, he dug and tiled 220 yards of ditch. Barnaby died on March 1, 1917, at age 94. He left behind some impressive kids. Alvin became an ordained UB minister and taught for a while at Huntington College (then called Central College). Horace became an attorney in Grand Rapids, and served in the state legislature for several terms. Milton attended Huntington College for three years, and worked in the Michigan state auditor’s office. James managed the Barnaby farm. Daughter Addie graduated from Huntington College and taught school in Grand Rapids. 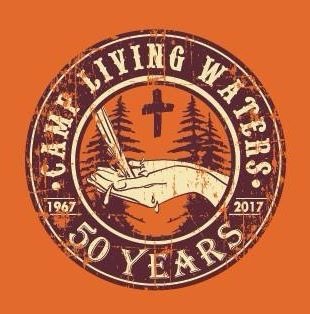 Over the last 50 years, we have been blessed to serve so many who have come to Camp Living Waters. We want to celebrate in honor of the past, present, and future of CLW! Come and join us for fun activities, great food, wonderful worship and music, memories, laughter, and so much more! We are excited that former directors Carlson Becker, Robert Kahly, and Chad Saxton plan to attend. Worship leaders Eric Cherry and Matt Moore are also planning to attend. Also, in honor of our 50th, the camp is having a special fundraiser to raise $50,000 to retire our debt and look to the future. We hope many will be able to join us on this special occasion. To register for the day or weekend or to give towards our $50,000 fundraiser, please go to www.camplivingwaters.org and see the many options available for the weekend. The Sambo Creek church in Honduras. We became involved in Honduras in 1945. For the first eight years, the work focused around several English-speaking churches comprised mostly of persons who had immigrated from Caribbean islands. Those churches separated from us in 1953 (it was very contentious), and we pretty much started over. This time, we focused on the largely unreached Spanish-speaking population. 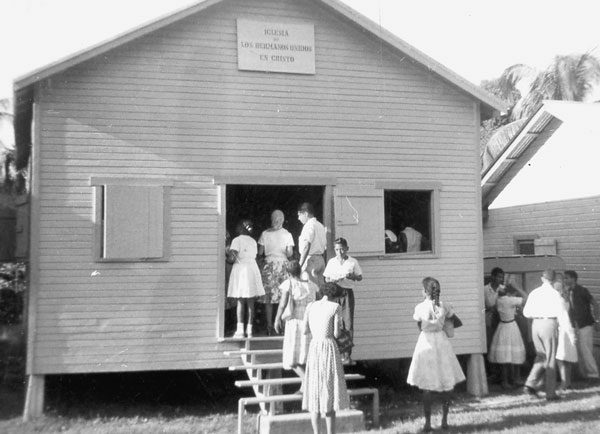 Leading the way was missionary Archie Cameron, who had come to Honduras in 1952. He was joined by fellow missionaries Don and Leora Ackerman and Betty Brown. Archie and a growing team of zealous young Christians took the Gospel from village to village. There were many new Christians. By June 1953, three Spanish congregations had been established, and another three were on the way. Some very capable Hondurans began leading alongside the missionaries–Eudaldo Mejia, Rufina Cruz, Manuel Flores, Andres Castillo, and others. By 1956, the Spanish outreach had touched many places–Jutiapa, Sambo Creek, Nueva Armenia, San Francisco, Santa Ana, five parts of La Ceiba, and various mountain villages. There had been over 300 conversions. There were three ordained ministers, and several future pastors were enrolled in Bible school or seminary. Seven churches and preaching points had been established, and in many other places, it was just a matter of time. Seven churches was enough to organize a conference. Which is what Bishop Ezra Funk did on April 23, 1956. Many changes in denominational leadership occurred in 1981. Among them was the inauguration of Dr. Eugene Habecker as president of Huntington College. He had been hired in 1979 as executive vice president–sort of a president-in-waiting. Upon the retirement of DeWitt Baker in 1981, after 16 years as the president, Habecker would take his place. As executive vice president, Habecker spent eight months developing a long-range, 17-year plan for the college. This “Quest for Quality” program, which would lead up to the college’s centennial in 1997, called for advances in curriculum, plus the addition of various buildings, including a new residence hall. That part happened even before Baker left office. On April 22, 1981, ground was broken for what became Baker Hall, named in honor of DeWitt Baker. It was built behind the original Wright Hall, which was later torn down and replaced with Roush Hall. 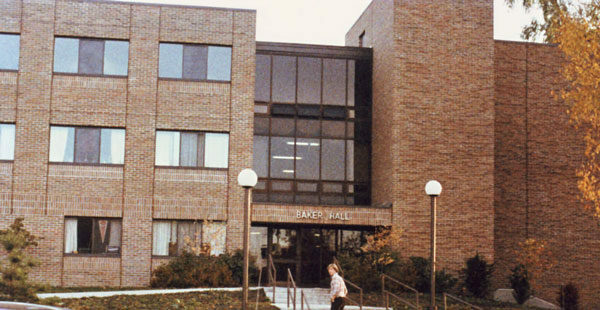 Baker Hall was the first residence hall built around suites; there were 3-4 suites per floor with a shared lounge, plus kitchen and laundry facilities. Today, female students occupy the first floor and male students occupy the second and third floors. Rev. 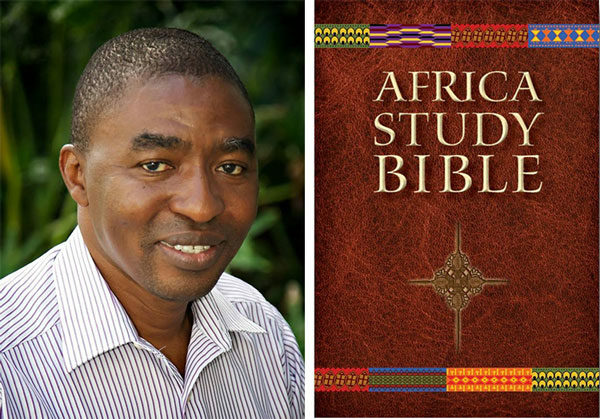 John Jusu and the Africa Study Bible. The publication of the Africa Study Bible was completed recently and has been made available for distribution. Dr. John Jusu, an ordained minister with the Sierra Leone United Brethren in Christ, served as the editor for the project. Dr. Jusu currently serves as the Dean of the School of Education and Social Sciences at Africa International University in Nairobi, Kenya, having served previously at the Evangelical School of Theology in Sierra Leone. This new Study Bible seeks to communicate biblical truth in a way that reflects and relates to African culture and daily life.